Today I’m sharing another one of our favorite picture books, and a storytelling basket to go with it. There’s a free printable template, too, so that you can make your own. 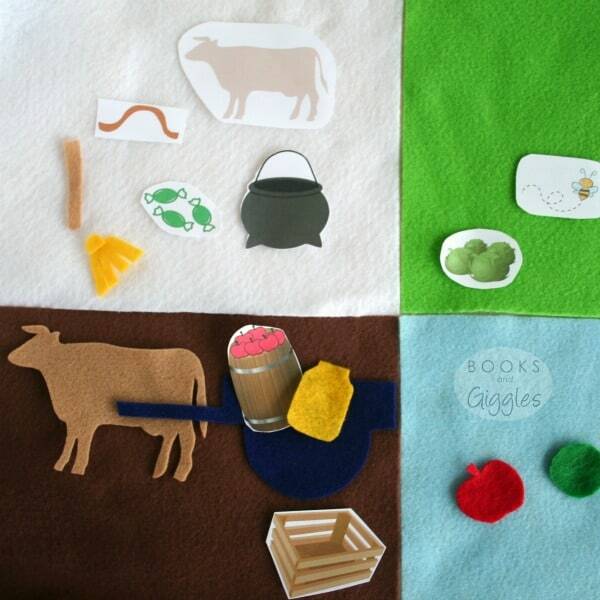 These pieces could also be used on a felt board. When Liam was in Kindergarten, he got to choose a book for me to read to the class. He picked the Caldecott-winning story Ox-Cart Man by Donald Hall (affiliate link). We didn’t own a copy, and I was surprised that he remembered it. I shouldn’t have been – it’s just that good. Now my twins are in kindergarten, and we’re excited to share it with them. Ox-Cart Man is a satisfying story about the cycle of the seasons in rural early America. The language is spare, and the illustrations are interesting and picturesque. It begins in the autumn with the man taking his homemade and home grown goods to market in an ox-cart. The story then continues through the other three seasons. The ox-cart man and his family work all year to make and grow what they’ll sell in the following fall. A storytelling basket is a fun, educational activity for kids. Being able to retell a story is an important reading skill, and a precursor to paraphrasing and summarizing. 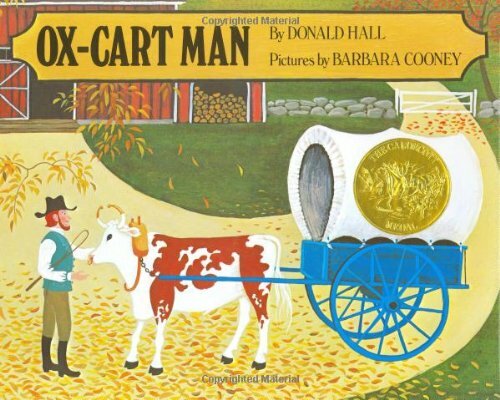 Ox-Cart Man has a logical progression that is easy to retell, if you can remember all the pieces. A storytelling basket is full of clues for just that. 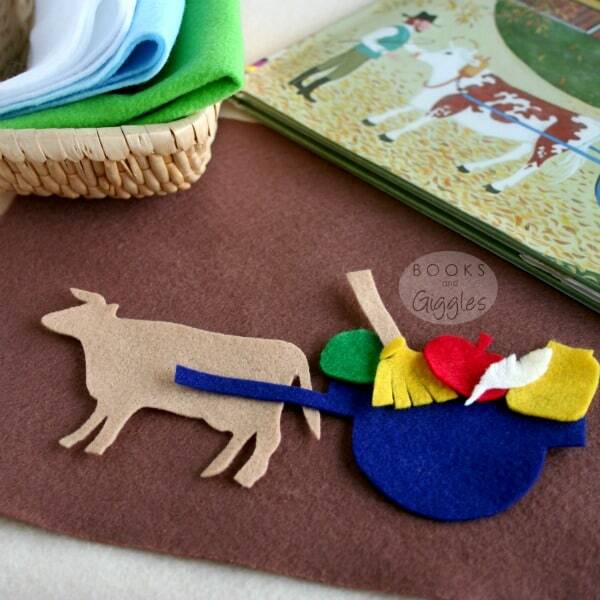 In our basket I included 4 plain felt rectangles in varying colors to represent the seasons. 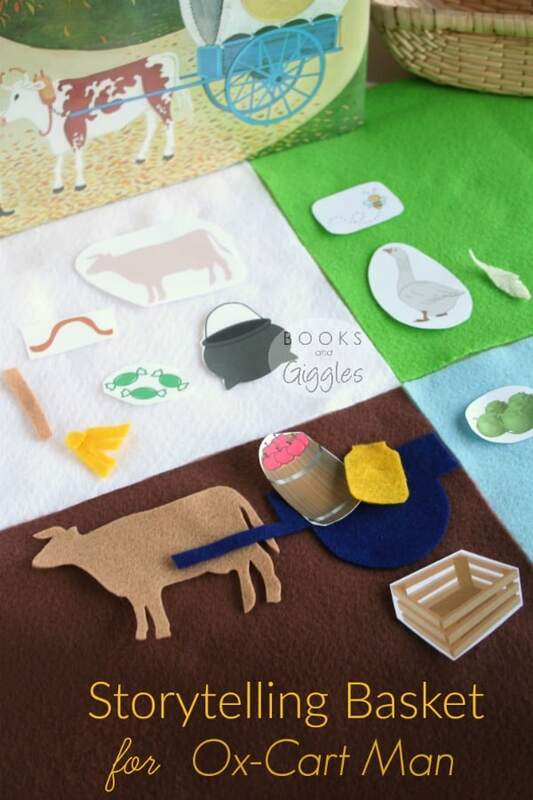 That way the child can more easily divide the story into sections for retelling. You can print out the template (below) and cut each item out and call it done, if you like. If you want something nicer and more durable, you can laminate the paper or use it as a template to cut the shapes out of felt. I wrote a detailed tutorial last spring that explains how to use freezer paper to cut out felt from a printed template. I traced the template onto the freezer paper. It was a simple shape, so it wasn’t a big deal to trace. The template for this story has a lot of pieces. I really didn’t want to trace them all. So I did a bit of research and found out how to print on freezer paper. I went with the fuse-the- freezer-paper-to-regular-paper method. 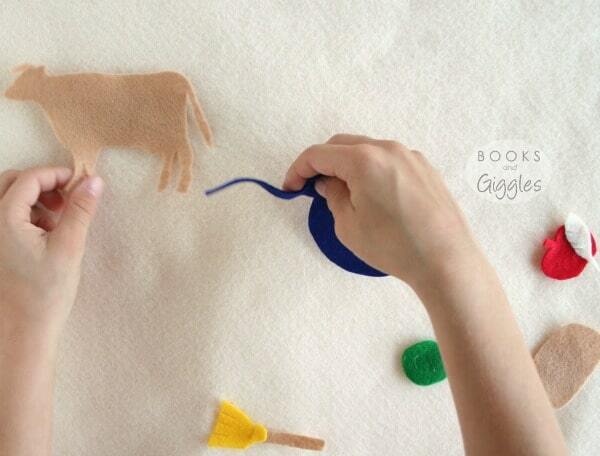 After I printed on the freezer paper, I pulled it off the regular paper and ironed it onto the felt. Then all I had to do was cut out the fused-together freezer paper and felt. Easy! Some of the shapes I cut freehand. Some I got lazy on and just used paper. Isabella loved getting to play with our set. With two girls in kinder now, I wonder if either of them will choose this story when it’s her turn to have mom read to the class. I’d like that. This post is part of the Kindergarten Blog Hop. Our theme this month is Pumpkins/Turkeys/Harvest. Check out all these other great kindergarten posts! I got to read a book to my son's preschool every Friday last year and loved the experience and special time with him. 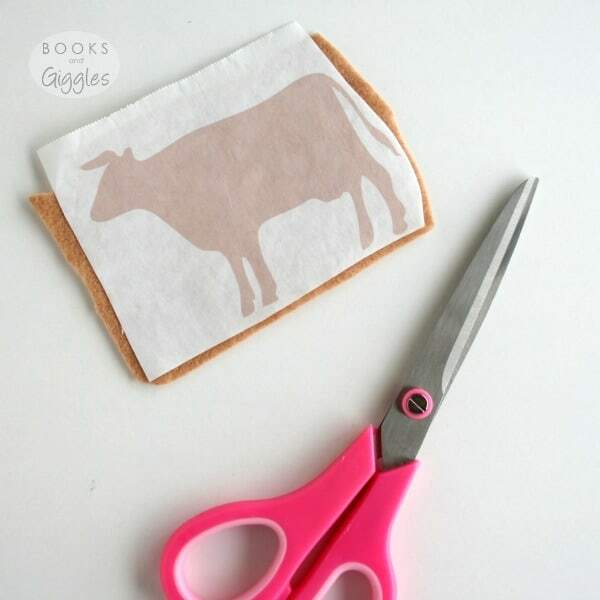 The freezer paper is a a great idea! I'll bet your son loved it too! The freezer paper method really does make cutting tricky shapes easy. My kids would love this! I am going to try to do it for them. I hope they like it as much as my girls do. 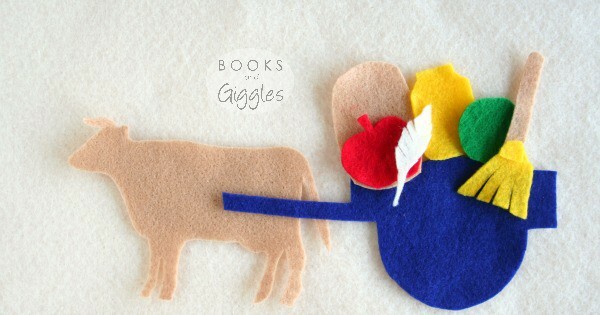 I really enjoy cutting out the felt shapes – it's kind of relaxing. I'm impressed with your cutting skills! I have never read this book but I will have to check it out of the library. My class is studying history now and this looks like it ties in with that. It's all about a good template and sharp sewing scissors. This really was easy to cut. Ox-Cart Man does tie in well with history, and even has basic economics concepts. What a fun activity! Your instructions make it really simple to do. I know my kids will love it.